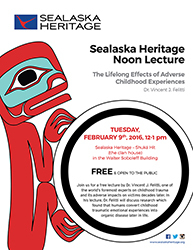 Sealaska Heritage Institute (SHI) will sponsor a free lecture by one of the world’s foremost experts on childhood trauma and its adverse impacts on victims decades later. In his lecture, The Lifelong Effects of Adverse Childhood Experiences, Dr. Vincent J. Felitti will discuss research which found that humans convert childhood traumatic emotional experiences into organic disease later in life. The findings stem from the groundbreaking Adverse Childhood Experiences Study, for which Felitti served as co-principal investigator. The study, known as ACE, was a collaborative, long-term effort between Kaiser Permanente and the Centers for Disease Control involving more than 17,000 adults. The ACE study revealed how 10 categories of adverse life experience in childhood have a demonstrable impact decades later on health risks, disease burden, social malfunction, medical care costs and life expectancy, said Felitti, a retired Internist from the Department of Preventive Medicine at the Clairemont Mesa Medical Office in San Diego, CA. and a Clinical Professor of Medicine at the University of California, San Diego. “The ACE study was groundbreaking because it revealed a powerful relationship between our emotional experiences as children and our physical and mental health as adults,” Felitti said. The findings are especially relevant in Alaska, where later research stemming from the ACE study found that the prevalence of adverse childhood experiences among Alaska Natives was almost double that of the non-Native population, said SHI Trustee and Senior Research Fellow Patrick Anderson, a champion of the research who has invited the physician to speak at various venues in Alaska and is now seeking policy changes to help stop the perpetuation of childhood trauma. The lecture is scheduled from noon-1pm, Tuesday, Feb. 9, in Shuká Hít (the clan house) at the Walter Soboleff Building in Juneau.